Figure 1: Studio To Go! Fervent Software's Studio To Go! 2.0 is a Linux distribution optimized for multimedia performance, especially for low-latency audio. This optimization is not too surprising when you consider that the brains behind Studio To Go! are also the fine minds behind the Rosegarden sequencer (version 1.6.0 now available), the Sonic Visualiser audio analysis program, the new Rubber Band library for high-quality time-stretching/pitch-shifting, and many other Linux sound and music projects. I profiled Studio To Go! 1.50 in this column. The latest 2.0 release includes an improved soundcard selector, expanded support for Firewire audio interfaces, more VST support, and more cool applications. I tested the demo version (Figure X), it's as stable and well-designed as the earlier release, and I found no new faults or problems that crept in between releases. Cost for Studio To Go! is £79.99GBP, which currently converts to approximately US$164.00. While this price is rather high for US purchasers, the product is truly worth every penny. It includes a finely-tuned kernel, a complete Debian-based Linux applications suite, thorough and well-written documentation and tutorials, outstanding support from the programmers at Fervent, and of course an impressive set of audio/video programs. Interested readers should read my earlier article and browse the Studio To Go! Web site for up-to-date details regarding product availability, pricing, and features. In the late 1990s I discovered Dataplore, a commercially-available program for digital signal analysis, display, and (limited) processing. I thought it was unique software then, and I'm happy to report that it's still a singular application. Linux has other signal analysis programs, but few (if any) equal Dataplore for the quantity and variety of its tools. Dataplore is definitely specialized software. Its intended clientele includes workers in the domains of statistics, scientific programming, mathematics, physics, medical services, and others in which data analysis is a critical concern and its display is an indispensable tool for the professional. Dataplore is likely to be of limited use for musicians, but audio researchers will certainly find an embarassment of riches for their projects. The program reads and saves WAV files, and it includes familiar audio analysis routines (e.g. Fourier, wavelet, and Hilbert transforms) along with its many new and unusual options. However, be aware that Dataplore is priced for professional researchers and laboratory facilities. €695 buys the basic program, with extension modules available for €222 each. A special package is currently available for €999 that includes the basic program and three modules. The Java Music Specification Language (JMSL) has resulted from the combined efforts of computer-music stalwarts Nick Didkovsky and Phil Burk. 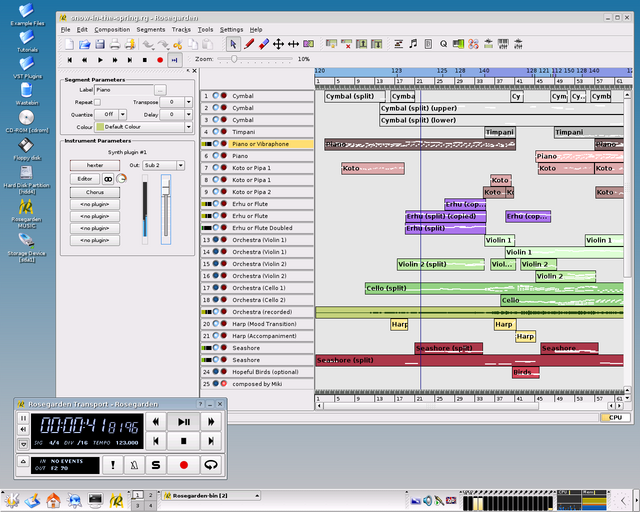 It is a complete sound and music production environment, similar to the Csound audio programming environment. 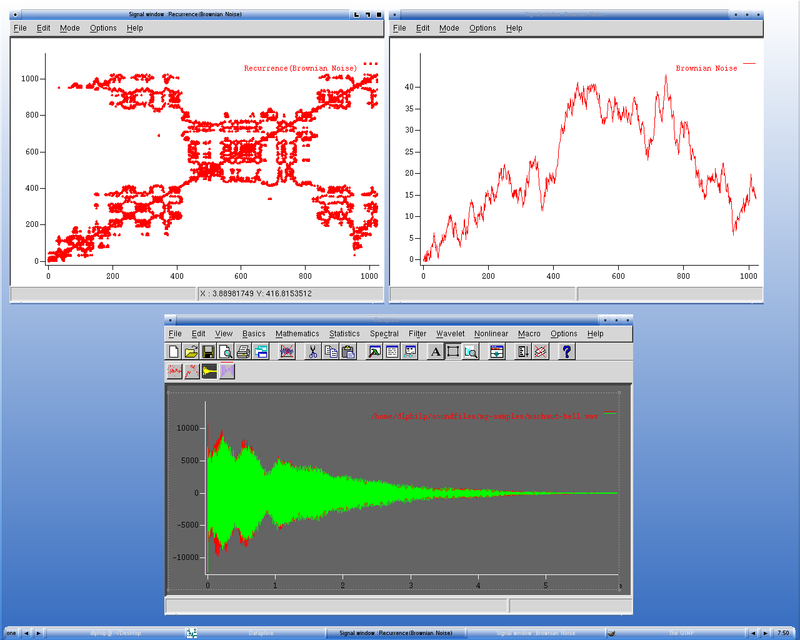 JMSL's key component is a language-based interface for the construction of sound generators and composition routines. This interface is coupled with a Java-based graphics engine for building control panels and other GUIs for the programs written in JMSL. Alas, time was short when I started working with JMSL, and I've had problems compiling and running the required MidiShare MIDI interface library. I was able to run a test program, but all my other attempts failed when testing JMSL examples that required MidiShare. At this point I've put JMSL on a back-burner until I can write a decent review of it, probably within the context of a survey of Java sound and music applications that run under Linux. Meanwhile, you're certainly welcome to do your own review by checking out the software yourself (a time-limited demo is available from the JMSL homepage). JMSL is priced in a tiered format. A student license is available for US$55.00 and a developer's license can be purchased for US$120.00. Academic site licenses are also available for US$500.00. These licenses grant the user the right to use the program on more than one computer and to distribute JMSL-based applications. However, the actual components of the JMSL system can not be redistributed. As more musicians migrate from Windows to Linux we can expect greater demand for those users' Olde Favorites to run under Linux, either natively or in some other environment (emulation, virtualization). Though that migration is now only a mere trickle, it's been growing and will continue to grow. Some Windows-based audio software developers have already extended their marketing by positioning their programs as viable under Wine. 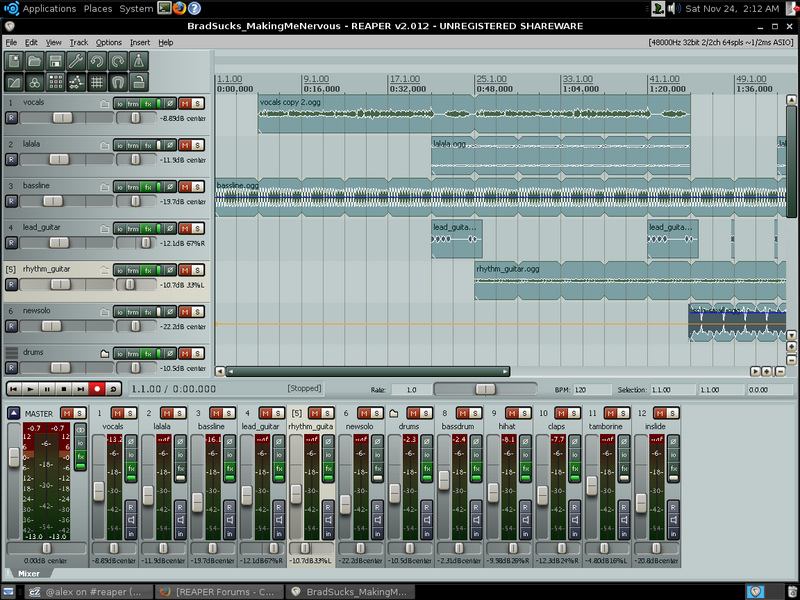 I've mentioned the Reaper audio/MIDI sequencer and VST host several times in my articles for the Linux Journal. Reaper continues to develop at a rapid pace (version 2.017 is the latest), its performance under Wine and the wineasio driver is still stable with low latency, but alas, the cost for Reaper's big bag of goodness has gone up to a whopping US$50.00 for a non-commercial license (what I and most users have purchased). The commercial license costs $225.00, a realistic reflection of the software's power and utility for enterprise audio production. The terms for both license agreements can be seen on the Reaper Web site. Daniel Alberto Laiseca is the author of the Syntheway VST plugins. I profiled some of his work in a previous column, noting that their quality was certainly good enough to pry some cash out of my pocket. 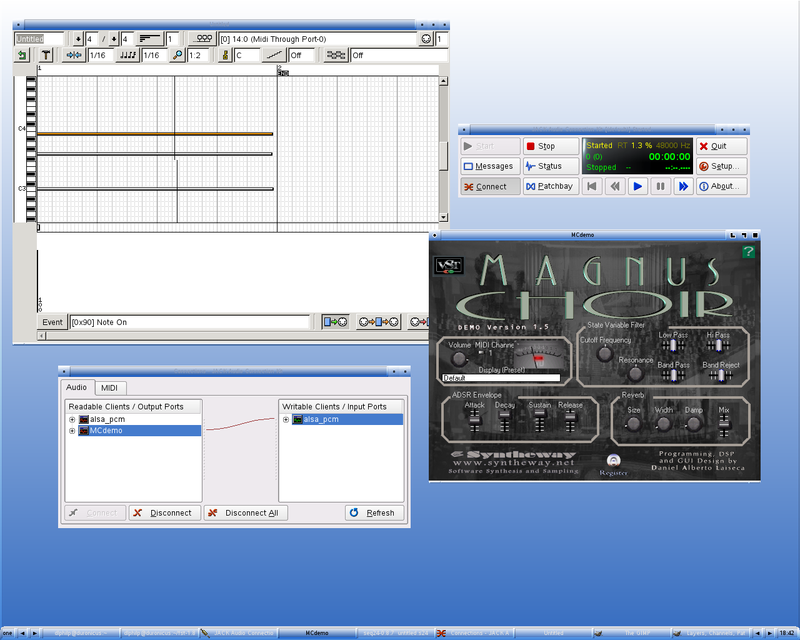 I did indeed purchase his Magnus Choir VSTi plugin, an excellent choral voice simulator, for use with the FST Wine-empowered VST host for Linux. David makes a point to advertise Linux-compatibility for his plugins via the FST software, a wise move in this writer's opinion. The Syntheway VST plugin suite includes a series of virtual instruments, a soundfont player, and a room-emulation reverb unit. They range in price from US$15 to US$50 and are well worth the purchase. Each plugin is completely programmable, comes with an excellent set of presets, and plays nicely with FST (and other Linux VST-support systems). Minor updates are free for registered users, along with six months of official technical support. Demos can be downloaded from the Syntheway Web site, but they include a noisy reminder that they're still demos. As one reader pointed out, "commercial" doesn't necessarily mean closed-sources, just as "proprietary" doesn't necessarily mean "for sale". The question of how to make money from free software development was the instigation for this article, and I discovered that there are income possibilities other than the traditional exchange of goods for money. Two popular channels are the service/support contract and the subscription model. The superb 64 Studio distribution can be downloaded for free, but the maintainers have wisely decided to offer contract services for customers who need immediate professional support. This kind of contract model is hardly new, though its deployment in the free software world is still novel. The plan for supporting development of the Ardour digital audio workstation is even more novel. Once a month a small amount is deducted from my bank account via PayPal and paid into an account for Paul Davis, Ardour's chief designer. Personally, I find this arrangement to be satisfying on my end. I use Ardour frequently, I believe it is a program that deserves my long-term support, and the payment method is convenient and secure. The Ardour Web page was the only resource I found that actually indicated its relative success with this model. Although the project hasn't quite reached its financial goals it's close enough to suggest that subscriptions may be a viable support mechanismm for some open-source software development. A discussion on this topic has just started on the Linux Audio Users mail list, and time will tell if the method gains acceptance with developers and users. Some notable music-making hardware is based on Linux. The spectacular Lionstracs Mediastation is a fully Linux-powered (by 64 Studio) super-keyboard with extended support for VST plugins and GIG-format sample libraries. Pricing for the Mediastation ranges from €2800 to €5800, or from about $4100 to $8500 in US dollars. Muse Research's famous Receptor is a Linux-based hardware host for VST plugins, a very successful host from what I can tell. Receptor compatibility is part of the standard evaluation criteria for the plugins listed at the KVRaudio site, which is some indication of the box's popularity. Receptor is available in a variety of models, with prices ranging from US$2099 to US$3399 (if purchased from the Muse Research site). I hope this article has been enlightening with regards to the presence of commercially available sound and music software for Linux. Speaking personally, I'd love it if these programs were all free and open-source, but such decisions are best left to the programmers themselves. As mentioned, many of these programmers already contribute to the FOSS community. Does commercial music software stand a chance in the open-source world ? I believe it does, but it must fill or create a niche for itself, and its programmers should remain aware that the FOSS community will always look and lobby for an open-source equivalent. To wrap up, I want to paraphrase a reader's comment on the first part of this article. Commercialism in the FOSS world is still met with some skepticism, but commercial does not necessarily mean closed-source, nor does open-source mean non-commercial. These aspects are not mutually exclusive, and I expect to see more developers take advantage of this situation. The bottom line is that programmers must somehow make a living, and if they want to make it from their own programs they need to consider all possible revenue channels. I hope this article has shed some light on some of those possibilities.